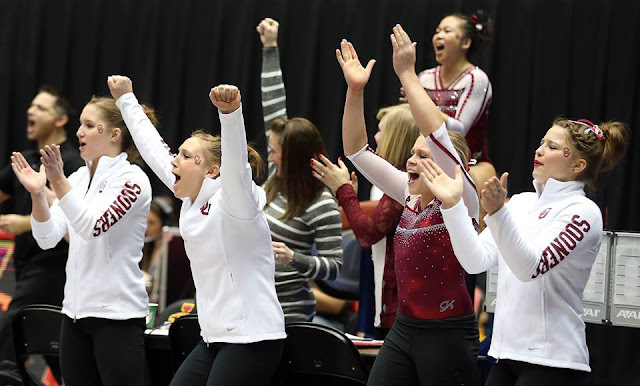 After posting two scores of at least 197.900 on this past weekend, the Oklahoma women's gymnastics team surged to No. 1 in this week's national rankings. It marks the first time since the beginning of the season that the Sooners, who were the No. 1 team in the preseason coaches poll, have held the top spot. OU started the weekend by posting a 197.925 in a quad meet victory at TWU over the Pioneers, No. 10 Auburn and Illinois State on Friday before scoring a 197.900 on Sunday in a dual meet win over Big 12 opponent West Virginia. The two performances raised OU's scoring average from 197.185 to 197.393. Florida is ranked No. 2 with an average of 197.220, while Michigan remains at No. 3 with a 196.860. Alabama (196.842) and LSU (196.705) are ranked No. 4 and 5, respectively. As a team, OU is ranked in the top three nationally on every event and rose into the top spot on both bars (49.386) and beam (49.321). The Sooners remained at No. 2 on vault (49.336) and jumped three spots to No. 3 on floor (49.350) after posting scores of 49.650 and 49.600 on the event in their last two meets. Individually, seven Sooners are ranked in the top 25 on at least one event. After posting a program-record 39.775 on Friday and adding a 39.600 on Sunday, junior Chayse Capps climbed from No. 13 in the all-around rankings last week to No. 5 this week with an average of 39.443. Senior Keeley Kmieciak held steady at No. 9 in the all-around with a 39.396. A pair of Sooners hold No. 1 rankings in Capps and junior McKenzie Wofford. Capps checks in at the top spot on beam with an average of 9.914 after recording the first perfect 10 of her career then adding 9.95 in OU's last two meets.Capps is also ranked 24th on vault with a 9.854 average. For the fifth straight week, Wofford checks in at No. 1 in the nation on bars, holding a 9.925 average. Sophomore Stefani Catour made her debut in the team lineup this weekend and is currently tied for 19th on beam with a 9.838 average through two meets, and junior Charity Jones checks in at No. 22 on vault (9.857) and 25th on beam (9.836). Sophomore AJ Jackson sits in seventh nationally on vault with a 9.893 and holds 17th on floor (9.896), while senior Haley Scaman is 11th on vault (9.879) and ninth on floor (9.918). The Sooners (13-1 overall, 2-0 Big 12) will compete in the Perfect 10 Challenge at 6:45 p.m. CT on Friday, Feb. 12, inside Cox Convention Center in Oklahoma City. Other teams at the quad meet will be No. 12 Denver, No. 17 George Washington and No. 30 Utah State. Tickets are available forpurchase online.